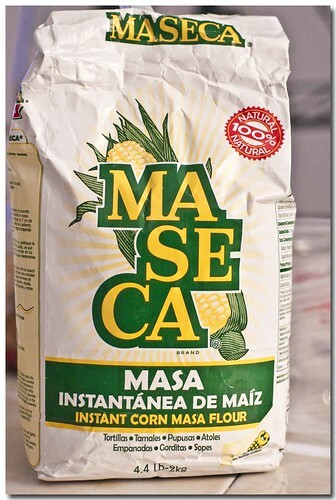 Maseca, magic in a bag. Just follow the directions on the back of the bag. 2 cups of Maseca, I spoon and scoop because the directions specify "loose measure"
Add 1 1/4 cups of warm water and mix for 2 minutes. Be sure and be true to this step, you must thoroughly mix and hydrate the masa. I have a tendency to be a slacker when it comes to mixing, mixing, stirring, stirring. Do and I say, not as I do. 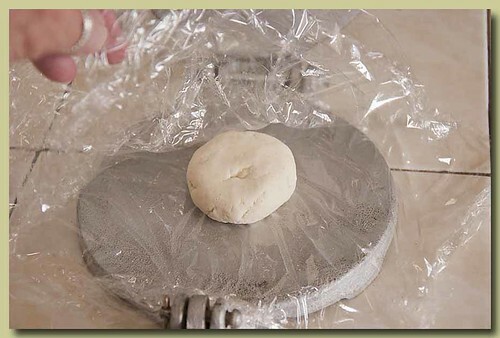 The dough should be similar in texture to a Pate Brisee. Smooth and more on the moist than dry side. I'd say it would be best to err on the moist side. From my experience it's easier to work in more masa than water. 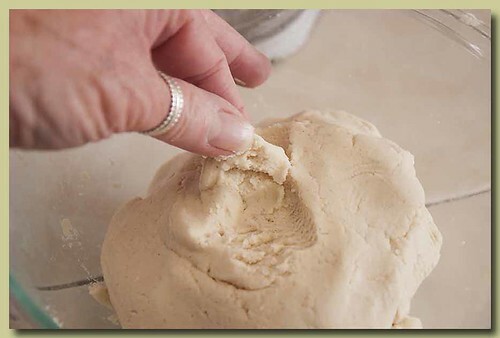 Pinch off a piece of dough, if it's dry and ragged on the edges, add more water and work it in a tablespoon at a time. Here's where I make some corrections to my previous post. 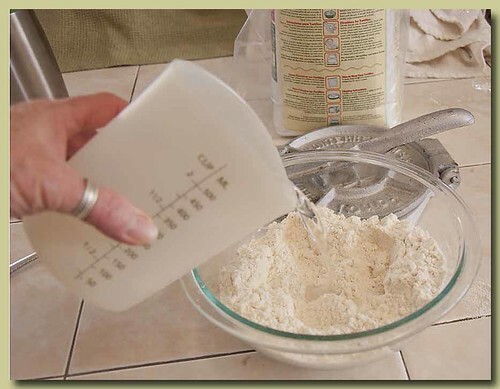 Having made a ton more tortillas, <slight exageration> I have found that if you gently press the dough in the press, <or gently roll with the rolling pin> then flip the top to the bottom, and the back <the part by then hinge> to the front, and gently press again the chances of the dough sticking to the wrap are greatly reduced. 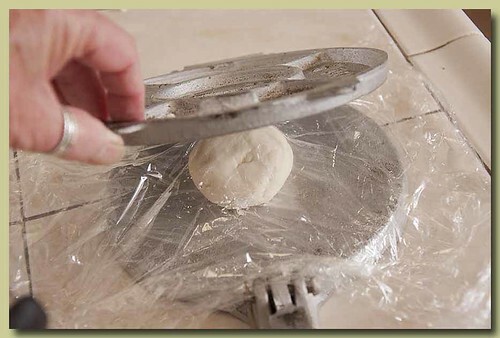 So, let's say the masa does stick to the plastic wrap or wax paper, here's my solution. Place your hand, palm down, on top of the wrap/paper, up to the edge of the tortilla where you are going to start lifting the wrap/paper up off of the tortilla. Keep a little pressure on the top as you gently pull the wrap/paper up off of the tortilla and back over the edge of your first finger. 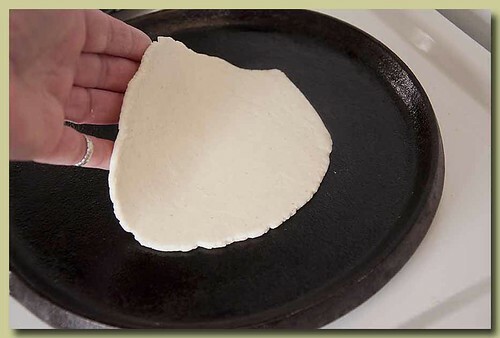 Continue peeling the wrap/paper back over the top of your hand as you work your way slowly and gently down to the other side of your tortilla. So, is that as clear as mud? 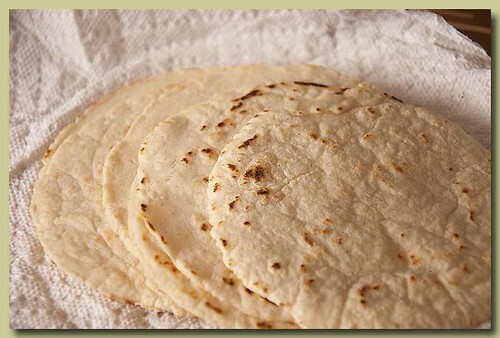 Now your tortillas are ready for the comal or skillet.